You have only a week before the Mayor's Official Inspector comes to judge your library, so be sure your assistants have all your books shelved! The Inspector is a tough cookie and will use her Official Checklist to grade your library on several criteria including shelf stability, alphabetical order, and variety - and don't think she'll turn a blind eye to books the Council has banned! You need shrewd planning and cunning tactics (and perhaps a little magic) to surpass your opponents and become Grand Librarian! 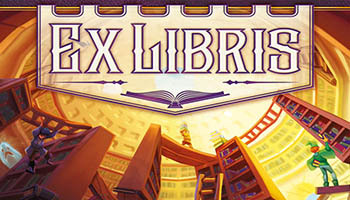 In Ex Libris.you are a collector of rare and valuable books in a thriving fantasy town. The Mayor has just announced a new seat in the Village Council: that of The prestigious (and lucrative) position will be a warned to the citizen with the most extraordinary library! Unfortunately, several of your book collector colleagues (more like acquaintances, really) are also candidates. 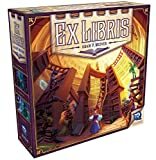 Ex Libris is played over a series of rounds in which players will take turns sending assistants to acquire books for their bookshelves. You will attempt to make sure that your books are in alphabetical order, on stable shelves, with more prominent works than your opponents, as few banned books as possible, a well-rounded variety of categories, and as many of your library's focus as you can manage. Instant Effect - First, draw one card for every assistant you have placed this round, including this one. Next, take the first player token from the player who currently has it. If you already have the first player token, keep it. Note: The Ghost may not visit the Diviner's Hut. When the Goblin Sneak visits the same location as one or more opponents, prior to activating any effects , you may attempt to pickpocket. Choose an opponent present at the location and name a category. That opponent must give you a card containing a book of that category, if able, or show you a hand containing none. Repeat this process for each opponent present at that location. Any cards acquired this way may be shelved. The solo mode is played over a series of five rounds played similarly to the multiplayer game, with a few key differences. Rather than competing against rival book collectors, you'll be attempting to have your librarian license approved. To do so, you'll need to exceed the score of the public library, which is represented by the entire discard pile.